Read Sept. 22, 2015 news release. A new report from the Sage Grouse Initiative (SGI) shows Brewer’s sparrow and green-tailed towhee numbers climbed in places where habitat was restored. Read September 9, 2015 news release. Sage Grouse Initiative 2.0 provides a four-year roadmap for investing approximately $211 million in sage grouse conservation efforts. Read Aug. 27, 2015 news release. 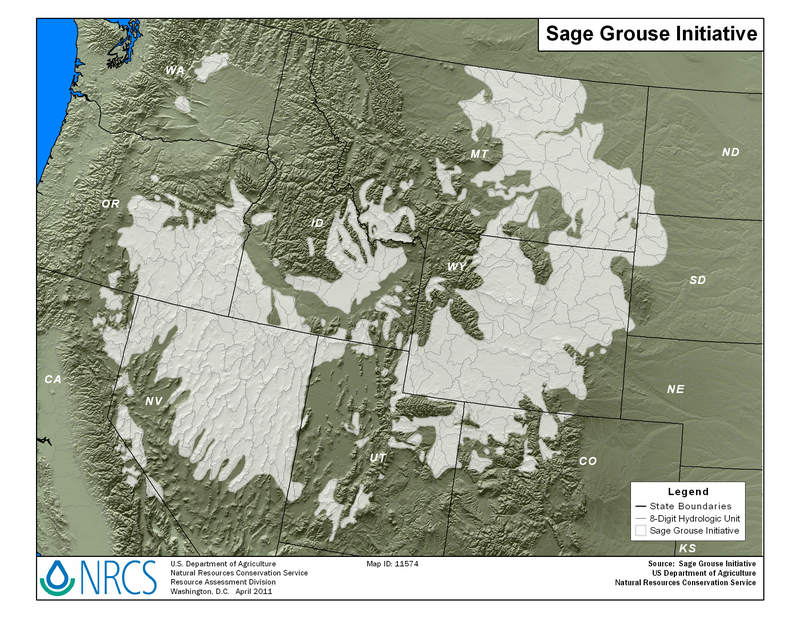 NRCS launched the Sage Grouse Initiative (SGI) in 2010 as a highly targeted and science-based landscape approach to proactively conserve sage-grouse and sustain the working rangelands that support western ranching economies. This innovative partnership of ranchers, agencies, universities, non-profit groups and businesses all embrace a common vision – achieving wildlife conservation through sustainable ranching. Learn more about the partnership by visiting sagegrouseinitiative.com . The greater sage-grouse, an iconic ground-dwelling bird of the West, has historically experienced significant population declines. Conservation efforts, like SGI, led the U.S. Fish and Wildlife Service (FWS) in September 2015 to conclude that the species did not warrant protection under the federal Endangered Species Act (ESA). Through SGI, NRCS works with landowners in 11 Western states to improve habitat for sage grouse and improve sustainability and productivity of native rangelands. Using a voluntary and incentive based approach, NRCS focuses its resources in priority conservation areas and areas with higher bird populations in California, Colorado, Idaho, Montana, Nevada, North Dakota, Oregon, South Dakota, Utah, Washington and Wyoming. NRCS uses Farm Bill conservation programs, such as the Environmental Quality Incentives Program (EQIP) and Agricultural Conservation Easement Program (ACEP), to provide technical and financial assistance to help ranchers accelerate installation of conservation practices on the ground. Conservation practices are designed to be win-win solutions addressing threats facing both sage-grouse and rangelands. This type of conservation work includes: developing grazing management practices to maintain nesting cover, removing encroaching conifers that have invaded sagebrush-steppe, securing conservation easements to keep working lands working as intact range in perpetuity, and making fences more visible to reduce sage grouse collisions. NRCS’ sage grouse conservation efforts are part of Working Lands for Wildlife (WLFW), the agency’s effort to accelerate conservation efforts for at-risk species while providing regulatory predictability for up to 30 years. How Does SGI Benefit Producers? Conserving and enhancing habitat benefits ranchers and sage grouse alike. On the ground conservation work provides better forage and grazing lands for livestock, and tools like conservation easements help ranchers keep their land intact long-term. Additionally, participating ranchers receive peace of mind knowing their conservation practices are in compliance with ESA regulations in case the species is listed in the future. How Does SGI Benefit The Public? SGI is an ecosystem-based approach to wildlife conservation. Working with partners, we are conserving habitat for sage grouse, as well as pronghorn, mule deer, elk, songbirds, and 350 other species that share the same landscape. All while helping to manage vast, intact ranchlands in ways that also create more nutritious forage for livestock. SGI’s conservation efforts also protect critical water resources, important in an era of drought and water shortages that impact communities across the West. Partners are key to SGI success. Over 100 partners are pooling resources, expertise and strengths to accomplish SGI’s vision of achieving wildlife conservation through sustainable ranching. Unprecedented cooperation aims to recover sage grouse and sustain a healthy sagebrush-steppe using proactive and sustainable strategies. Diverse partners include conservation districts, nongovernmental organizations, private corporations, land trusts, state agencies, universities and federal agencies.